Jack-o-Swirl—Swirl Pumpkin Pie frozen yogurt and top with cheesecake bites, white chocolate chips and whipped cream, no carving required! Mummy Madness—Start with Alpine Vanilla frozen yogurt and top with white chocolate chips, shredded coconut, mini marshmallows, and whipped cream. For an extra spooky swirl top your cup with raspberry drizzle. Tombstone Swirl—Swirl Fudge Brownie Batter frozen yogurt and add gummy worms, marshmallow pieces, chocolate chips and crushed Oreo® cookies for a combo that’s definitely a graveyard smash! The Mad Scientist—Start with Cookie Madness frozen yogurt and add frosted animal crackers, chocolate sauce, caramel sauce and whipped cream for a crazy tasty swirl! FrankenSwirl—indulge in one of our unique Froyo Smash sandwiches. Ask your local store for current their pre-made selection, or make your own! Try swirling Pistachio Gelato between two Double Chocolate cookies and coat with crushed Oreo® cookies for a reengineered take on a classic treat. 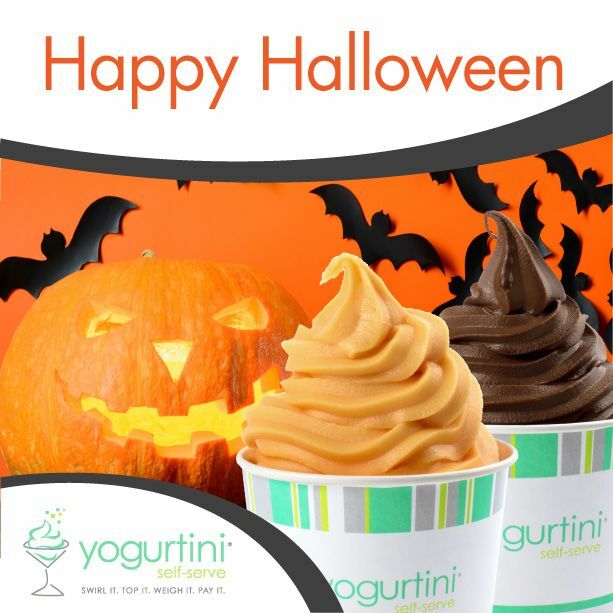 Next time you’re in, try out one of our spooky concoctions and share your experience with us on Facebook and Instagram @yogurtini. We hope everyone as a fun and safe Halloween!